Figure 1. 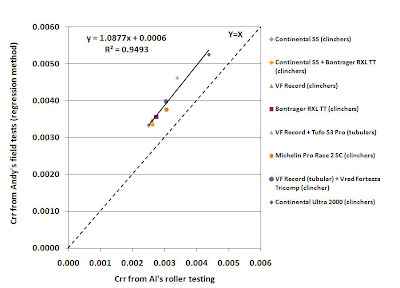 Crr of various tires measured on the road and on rollers. Note that, except for the Continental Supersonic (SS) and Michelin Pro Race 2 SC data, where n=1, the field test results are averages based on 3-6 tests performed on separate days. The average (+/- SD) coefficient of variation across days was 7.9 +/- 2.8%. So you get the same results as Al, just a bit worse Crr (as it is on the road instead of a smooth roller). All good! Now how come there is a Tufo in there ;-) ? Sorry, just found your comment! The Tufo S3 Pro was on a track disk wheel that I borrowed back in 2004, after we had sold off my wife's racing gear. Since it was a borrowed wheel, I didn't feel it was proper of me to change the tire. The good news is that it gave me another point to compare to Al's roller tests. It would be interesting to know the % of increase of rolling resistance when changing from plastic rollers to real asphalt roads. For tires with similar tread patterns, the % should be similar. I have also some doubts about the suitability of testing on rollers because there is two contact patches between the tire and the virtual ground (roller) and this could affect the results. One last thing, have you done all the tests with the same bike and wheel? Eduardo, the graph answers your questions and doubts. Eduardo: look at the regression line. It says that to transfer from rollers to asphalt you multiply by 1.09 and add 0.0006. I.e., you add 9% and then add .0006. I would be interested to see how tire pressure and rolling resistance change based on road surfaces. On a smooth roller the higher the pressure the lower the rolling restistance, but it has been argued many times that this is not true when you introduce all the imperfections of a road. maybe somebody should create an asphalt roller? Andy...just curious, but what's the slope if you force the y-intercept to be zero? Tom--took the data off the graph and got y=1.28x+0. FYI, I get y=1.0813x + .0006 using my estimated data, so not too far off.